Estonian architects Muru & Pere have designed an outdoor kitchen in Tabasalu, near Tallinn in Estonia. 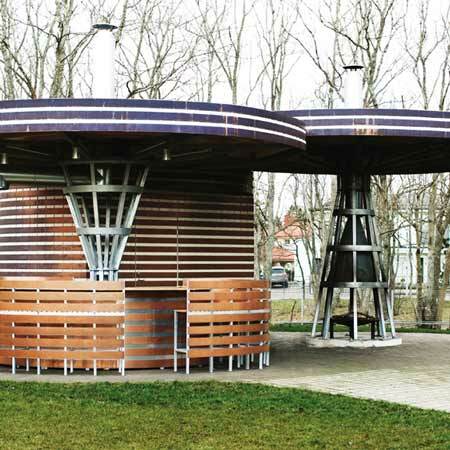 The shelter consists of two large disk-like roofs supported next to a tool shed on two pillars, which are wrapped in copper bands. Seating is arranged in a circle around the grill. See Muru & Pere's previous outdoor kitchen in our earlier story. Photographs are by Tarvo Varres. Home creation is a dynamical process: if something is done, there is always something to add, to change or remove elements that have now become excessive. The summer kitchen in Tabasalu has been added to the ensemble in the aforementioned post-production process. The roof of the kitchen is constructed of two overlapping circles. In the centre of it there is a tool shed. The rough northern aesthetics of the copper house can also be seen here. The massive roof construction has been unabashedly left visible. The construction details in general can be linked to an industrial rather to a bourgeois grill idyll. Different parts such as the grill counter and its seats, the shed and the roof edge become a whole due to the dark magenta coloured stripes made of out composite material. Only two roof posts are striped with real copper, one of them has a fireplace in it. The summer kitchen achieves its true splendour when the bower plants are reaching towards the sky, casting a cool summer shadow and creating a sense of space. The building has got a strong northern sense due to its pristine and massive shapes. In a rough climate the role of the fireplace has always conveyed a dual meaning, one for the practical purpose of making food and the other bearing a symbol pointing to traditions and continuation. This summer kitchen is therefore constructed not only for this generation, but also for the next to come; it will not spoiled by storm or wind, even the grill cover made of stainless steel can be lifted by a strong man. On the other hand, the summer kitchen is connected to the modern world only through its materials and constructions. The small building that acts as a remainder of an industrial sculpture gives a clear message that its roots are in the present day, making a contribution the modern and uncompromised house. Urmas Muru, Peeter Pere, Anna-Maria Erik.